Yesterday I took four teenage girls to the beach. Jessica started planning this trip last week. My Mom agreed to take the little kids overnight for me again so we were free to go and spend the day. Originally another mom was going to go and drive more kids. But of course, two days before the trip she backed out with one excuse or another. I don't understand why I am the ONLY mom in her group of friends that is not a flake. So 2 girls were coming to our house at 9:30 then we were picking up one more on the way around 10. At 10:30 the first 2 girls finally got here. Then we went and picked up the other girl, got gas, went to the bank, the .99 cent store for snacks and then Jack In The Box because by that time it was lunch time and I was starving. By the time we were actually on the road it was almost noon. We got there without any problems! It was $8 to get into the park. We probably could have went somewhere for free but I wasn't real familiar with the area so I did an Internet search ahead of time looking for somewhere to go and this place had pretty good reviews. So we get out of the car, load up with all of our stuff and brrr was it cold. SO glad I remembered to bring my sweatshirt at the last minute. I almost forgot it. We set up a little area with my chair, a blanket, ice chest and our stuff. Jessica thought she had never been in the ocean but she has she just doesn't remember because she was too little. So they all ran with her into the water for the ceremonial "first time". Shortly after that I had to move everything up the hill a bit so we wouldn't get wet. Then I pulled out my book and read (and shivered) while they played in the ocean. Then Jessica's friend broke out the kite she bought at the dollar store. Can you believe she is 15 and had never flown a kite? She was rather proud of herself after she got it going. Then she brought it over to me to hold lol. Shortly after that they went back into the water for her to get the sand off and all got tackled by a giant wave. I sat there and laughed for a good five minutes. It was totally hilarious!! After about three hours at the beach they were done. We loaded everything up, then Jessica realized she lost her shoes somewhere. Hmmm. Good thing they were only a cheap pair of flip flops. We loaded up in the car and did the 2 hour ride home, stopping at Denny's for dinner where one of the other girls couldn't find her shoes either so they tried to hide their feet a little when we went in. Lucky for us there weren't many people there and they didn't give us a bad time about the no shoes no service (although they didn't have a sign that said that anywhere). All in all it was kind of fun. It would have been better if it was HOT. 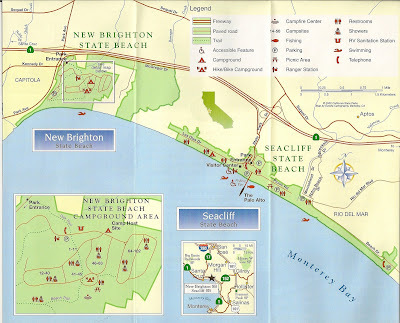 I drove around and checked out the campsites and it looks like a fun place to camp since you can just walk down a trail to the beach. I've always wanted to go camping on the beach. It looks like so much fun!! 2 hours isn't a long trip to the beach, you should go much more often! I'm glad you and the girls had a good time... we love going to the beach too. That looks like a fun day. I hate going to the beach when it's chilly. I hardly ever get into the water. I just sit on the side and shiver, too.